View of “Forever Teddy Complex,” 2019. Walking into Sandy Brown gallery, one is confronted by several bears. No, one hasn’t stumbled into one of Schöneberg’s gay bars, though it’s hard to discount a certain element of homoeroticism in Timothy Davies’ freestanding plywood sculpture We 2 Bears (Double Beach Bum) (all works 2019). Alluding to David Hockney’s painting We Two Boys Together Clinging (1961) and Walt Whitman’s Leaves of Grass, these two bears wearing red shirts (modeled on a collaboration between the toy manufacturer Steiff and Ralph Lauren) have their hands tucked into the pockets of their white briefs, creating suggestive bulges. Nearby is another plywood bear sculpture, Single Bear with Shopping (Friedrichstraße), this one more bourgeois in a navy suit and holding Le Creuset and Galeries Lafayette bags. Painted and UV printed, these works mimic the corporate mascots deployed by fashion labels, and like the disarming qualities of a plush toy, these brands are nonthreatening and almost aggressively middlebrow. This is not a toy is an empty window display made of Teddyplusch cotton fabric, which invites viewers to sit and project themselves as if they were a domesticated pet awaiting adoption. 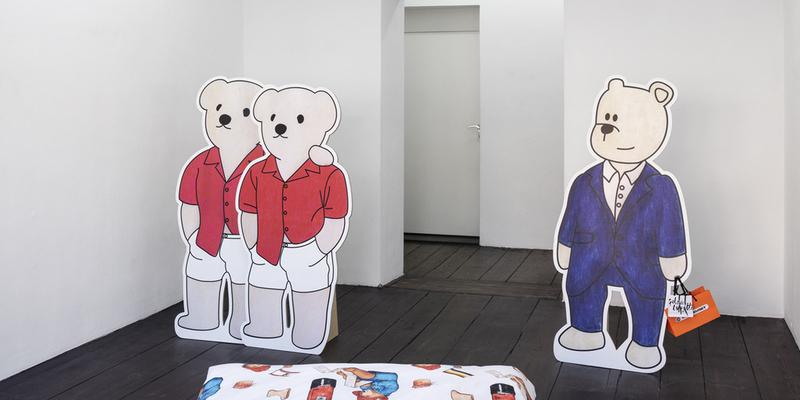 The centerpiece of the exhibition, Expanded Single (Paddington x Primark Geo Print Bed Linen), is a twin bed with a duvet printed with Paddington Bear, who hold flags of Bear Pride and Berlin’s bear mascot. The exhibition’s title, “Forever Teddy Complex,” refers to the personal branding and marketing strategy of performing cuteness, self-infantilization, and vulnerability. Eschewing the obvious ideological implications of nationalism or Adornian critique, Davies’s work calls to mind Erving Goffman’s 1956 sociology book, The Presentation of the Self in Everyday Life, as it fleshes out the play between the plush toy’s semiotics of innocence and the logic of capital responsible for drawing the consumer into the teddy’s beady eyes.